Mostly Board Games: Why Isn't Card 08 On The Box? Why Isn't Card 08 On The Box? Dungeon Time: The first kickstarter game I've ever backed. It arrived a few weeks back but it's only now that I've managed to find the time to learn and play it. Seven plays over two nights and I can say it was a reasonably successful kickstarter choice. 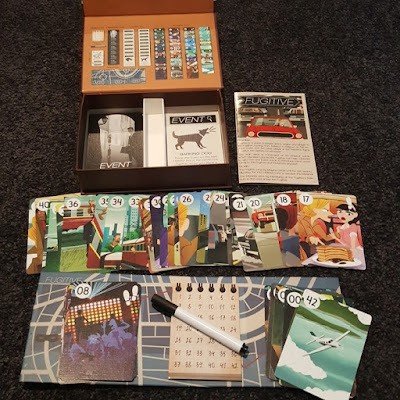 Its a co-op real time card game with varying levels of difficulty, where you and your team of adventures have to pack the right gear into your backpack to complete a predetermined number of missions. To complete a mission, you need to have the required contents in your backpack already before you play the mission card, which often gives you a reward of more equipment. The catch is, all this is done in 5 minutes and with everyone shouting and throwing items into the backpack, things can get confusing pretty quickly. Compound this with the backpacks limits of only holding 8 different types of items, and it becomes very easy to forget what's been placed in the bag during the frantic five minutes of play. Put too many items in and your bag will break causing you to fail. Don't put enough items in and your missions will fail, which often can cause a flow on effect when you were relying on the reward items. Its fun, frantic, quick and a nice diversion from heavy thinking games. But that doesn't mean this game is easy - seven plays only saw us beat the training mission and level one! Lost Cities: It's been a little while since this two player classic card game hit the table. A simple game of strategy, easy to grasp, but hard to master and balance. There's luck involved but enough ways for you to skilfully play that eliminates a good portion of this game being the luck of the draw. If you like two player games, this one should be at the top of your list! Coloretto: With the in-laws here, this is the third week in a row for coloretto. Not much more to be said but after losing the five previous games, I've now won three in a row. Great game to pull out with those less inclined to play something with a lot of rules/pieces. Not a whole lot to it, but the few choices you get keep things interesting. Jamaica: After not playing this for months, Jamaica has been out two weeks in a row. I'd say its highly unlikely it'll be back here next week even though I finally had my first win of Jamaica ever. Same as last week, lots of style, some substance, but mostly I'd rather play something else for the good hour needed to play this. Fugitive: The last of my three kickstarted games has finally arrived. I currently have no games expected in the mail, and while there's a lot I wouldn't mind adding to the library - I think I need to take a small pause so I can actually play some! As for fugitive, its a 2 player game where one player takes the role of a fugitive and the other a marshal trying to track them down. It looks really nice and even comes in a tidy briefcase-like box (similar to the one the fugitive is seen running around with!) and I believe it plays a bit like a game of cat and mouse. Hoping to try this one in the upcoming week!